On my morning walk today I listened Radiolab, and found an unexpected treasure. 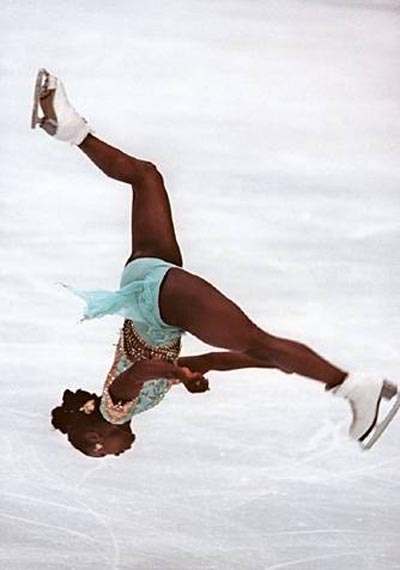 In the episode On The Edge, there is a beautiful description of a mid-performance calculation/ improvisation by figure skater Surya Bonaly. When someone is in flow state, frequently known as being “in the zone” time often seems distorted. The speed with which someone can think and plan is remarkably fast, yet can seem to them to be slower. This yields the opportunity to change, improvise and recover- often without the audience being able to detect anything at all. As explained in the episode, Surya was injured for this performance. She pulled a muscle in her left leg the day before the competition, and she was also suffering from a ruptured Achilles tendon. Surya couldn’t walk up stairs- she had to be carried. She was determined to compete, as this would be her last Olympics. Surya then does a backflip, which is not a legal move in skating. As she does this- she makes another calculation. She remembers that for a jump to count, you have to land on one foot. The backflip is at 3:30.